Breathtaking decor and an energetic vibe await you at the NoMo SoHo -New York*s exclusive destination hotel centrally located in the SoHo district -renowned worldwide for fashion and design. The 263-room hotel features all new restaurant NoMo Restaurant -as well as the full sensory bar and nightlife space -NoMo Bar. 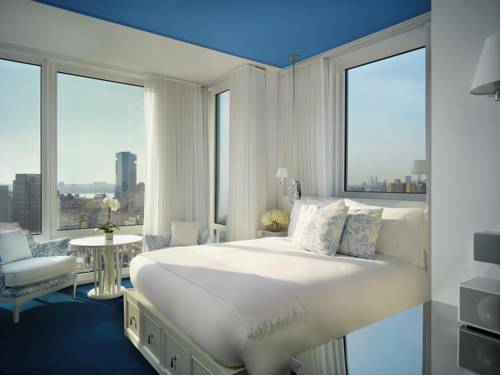 From the world*s finest shopping to New York*s exciting cultural and historical landmarks -the NoMo SoHo provides a convenient starting point for your day and each evening as you return -the luxuriously appointed guestrooms will provide a welcome respite rejuvenating you for the next day. Major design firms are represented in the shopping district as well as couture and boutique studios catering to individual tastes. NoMo SoHo exemplifies the artistic spirit of the neighborhood. All boroughs of Manhattan are easily accessible from SoHo including Times Square -Central Park -Empire State Building -Madison Square Gardens -Brooklyn Bridge -911 Memorial -Rockefeller Center -New York Public Library -and Lincoln Center for Performing Arts. NOMO Kitchen. Featuring a variety of selections to please even the most sophisticated palate -our award-winning chefs are encouraged to experiment with inspiration in order to deliver a one-of-a-kind experience to our patrons. Craft cocktails and signature drinks complement the extensive wine collection of NOMOs lobby library bar -the exclusive nightlife venue located at NOMO SOHO. Experience the scene at one of SoHo*s hottest new concepts.